Yesterday was our first snow. It's not even Thanksgiving yet but we already have about 6 inches of snow outside. Oh how you loved the snow. It probably was your favorite season mainly due to the air temperature. I remember how you would lay for a long time in the cold snow, burrow in it, eat it, roll in it and frolic in it. I know your favorite way to kick off the winter season was to come with us to chop down our Christmas tree. Next weekend when we go, you will be noticeably absent. Oh how I loved to see you run between the Frasier Firs, Blue Spruce and Scotch Pines. We would let you off leash and you would get lost among the acres of trees. A quick call of "front" would have you running through the trees until you found us. You were so happy then and so much a part of our lives. You still are. I want you to know that. One month later, I still think of you so many times a day. Yes, I am still sad and I still miss you terribly. But I still see you. The other day I was driving Peyton and Hailey home from school. It was mid morning and there was a Berner walking away from the street we were approaching. Suddenly, as we reached the street, the Berner turned around to look at us like it heard something. Maybe it was a squirrel or another dog, but I'd like to think it was you. And, just yesterday a new clump of rust-colored hair appeared in my workout room close to where you used to lay as I worked out. Austen, Peyton and Hailey still talk about you too. Peyton wants a new puppy and her teacher recently asked me if she was getting one since she talks about it at school a lot. I think Hailey would call any new puppy we would get, especially a Berner, Adler. She was so confused when we saw that Berner on the way home from school. She sees you in the many pictures in our house and says Adler's picture, but I don't know if a 2 year old can really comprehend that you are not physically here anymore and then see another Berner who looks so much like you and wonder why you don't live in our house any longer. She's growing up our Hailey. 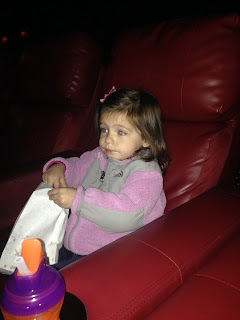 She went to see her first movie in a theater on Nov. 7 - the Peanuts Movie. She was just 2 years and one month old (almost a year younger than when Austen and Peyton saw their first movie), but she did great and sat through about 2 hours of the movie and previews. When you were with us, I couldn't wait to see what Hailey would be doing at the next stage. But, I will tell you that I was torn about wanting to see her grow up because I knew that meant you would be getting older too and I didn't want that to happen because I knew our time together was growing short. I may not have to worry about that any longer but I do worry that she won't remember you. The reality is that she probably won't. Thankfully we have so many pictures and videos of you. I can't believe how many there are. Even if we were taking a picture or a video of one of the kids, you were there. You were and still are a big part of our family. In fact, you made us a family as you were our first baby that Tom and I were honored to take care of. I hope you know how much you are missed and how much we all loved you. How much we still love you. Winnie the Pooh said, "How lucky I am to have something that makes saying goodbye so hard." Yes, we were lucky and blessed to have had almost 11 great years with you. Thank you for loving us too. Is She Really That Bad?